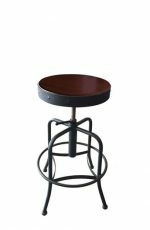 Buy Adjustable Bar Stools & Swivel Stools - Free Shipping! Is your counter around 36 inches high? How about 42 inches? An adjustable stool will do double duty and fit both heights. 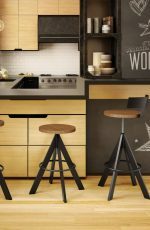 They’re great if you think you’re going to move in the near future and want a stool at your current 36-inch high counter and later, realize you need a stool for a 42-inch high counter. Since you have an adjustable stool, you don’t need to buy new stools, just adjust the height. 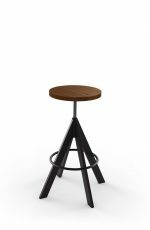 These stools are also great for any finicky family members or friends because they can adjust the seat height to 27½” or even 31¼” if they’d like, making their seat height customized to their preference. 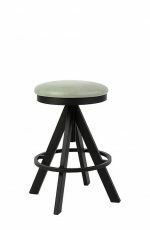 Majority of adjustable stools come without a back, but we have a few that come with a back if you need back support. 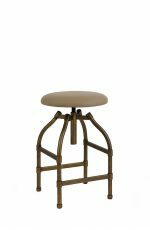 Check out our Architect and Uplift stools for an adjustable stool with a back. 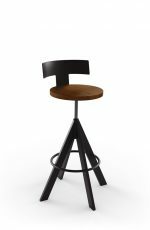 Typically, adjustable barstools are modern or industrial in design. Straight lines form the base and are accompanied by a round or square seat. 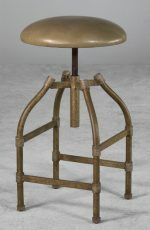 In between the base and the seat is a pipe-like piece that allows the stool to be adjusted up or down, like a screw. An adjustable height stool is great for salon owners because hair cutters can not only can adjust the height of the seat when cutting hair, but they can also swivel, so if you want to swivel the stool around to cut someone’s bangs, it’s quick and easy. Your customer will be comfortable in these, especially the ones with the backrests. These stools also have footrests so your customer has a place to rest their feet while you get them to look their best! Majority of these comes with a screw underneath the seat. That screw allows you to adjust the seat height. To get the seat higher, you’ll swivel the stool counter clockwise and to get the seat lower, you’ll swivel it clockwise. Sit on the stools to adjust them to your preferred height or get up and adjust, it’s up to you! At Barstool Comforts, we bring you the best in durability. We don’t settle for mediocre. And you shouldn’t either! 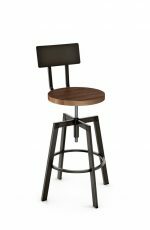 These adjustable stools are absolutely the best in quality and durability without being overpriced. All are fully welded which means they won’t wobble or break overtime. They’re also available in a variety of powder-coated metal finishes, which won’t peal overtime. And they’re all made of heavy-duty steel. From top to bottom, these have been built with high standards from our manufacturers who want to see you use these for decades. They believe in good quality and long-lasting furniture, just as we do. Does your kitchen have some wood in it? 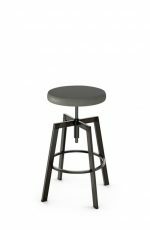 Choose the Architect stool for a metal stool with a wood seat or backrest. 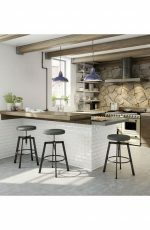 The stool is great for modern or industrial style kitchens. 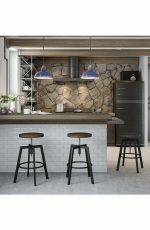 It can even play well with contemporary country kitchens, depending on the colors chosen. Looking for an all black adjustable stool? No problem! We have fabrics, vinyls and metal finishes in black. How about an all-white stool? We can do that too. Just choose from our white fabrics, vinyls and the 63 Snow metal finish. 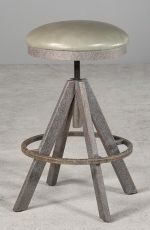 You can also get these stools in a variety of colors including brown, red, gray, green, and even pink! The color combinations are endless and we encourage you to think different. After all, it’s your kitchen. Why should it be like anyone else’s? If you have questions about which stool is best for your space or need help with choosing colors, feel free to send us a picture of your kitchen or bar. We’ll be glad to help you find the perfect stool for your room and your style. Happy browsing!